Learn about Iceland’s energy source at a geothermal power plant. Explore Skaftafell National Park, which spans three glaciers on the southern edge of Vatnajökull, Europe’s largest icecap. Soak in a naturally heated river in the colorful, volcanic Landmannalaugar region. The world’s 18th-largest island is also one of the most fascinating, where eons of glaciation, combined with an active molten core, have resulted in a landscape like few others on the planet. Traverse the landscape and national parks on foot, studying Iceland’s natural and cultural history with local experts. Don’t miss a chance to revitalize in one of South Iceland’s many thermal pools. No reviews yet for this trip. Browse other reviews below for Road Scholar . This was my wife's and my first trip with Road Scholar. At the time (April, 2012), it was not possible for Americans to directly visit Cuba. You had to do it with a cultural/educational group, often associated with a university. Or, you could fly to Canada, Mexico, or Europe first and then get a flight to Cuba from there (while risking a ~$10,000 fine from the US Government). We opted for the legal route with Road Scholar. It was a fantastic trip! We had a small-ish group of about 20 people and a wonderful guide, José Luis (who, like most Cubans, had never been off the island). While in Havana, we enjoyed great history/culture lectures from experts, toured various parts of Havana (including Hemmingway's home in the hills nearby), and, on our own, had the opportunity to have dinner at a paladar -- a restaurant inside someone's home. The Cuban people are friendly but the infrastructure of their country is in shambles. It's been a long time since Russia's deep pockets left the island (1991), and you see poverty everywhere. But not the begging-in-the-street kind. Cuba provides universal health care, education (including room and board all the way through grad/med school! ), food staples, and a very modest income (~$30/month) to everyone. Most people add to that income by working on the side. After Havana, we traveled to Cienfuegos. From there we saw the infamous Bay Of Pigs, but also the wonderful Benny Moré Art School where we learned of the fantastic support for the arts by the Cuban government. Children are identified in grade school as having artistic talent and then funneled into magnet schools like Benny Moré to study art for their entire scholastic career! Don't go to Cuba for the food. It's edible (and won't make you sick) but rather boring. You mainly get the "three amigos": fish, pork, or chicken, along with rice and/or black beans. But the aged rum is superb and so are the cigars! Cuba is fantastic. Go enjoy it! Loved the variety of different hotels, the expertise of the individual tour guides, the meals and especially the beautiful countryside. All 17 of us on the t rip got to know each other well, thanks to the kindness, the personality and the organizational skill of Mark, our tour director. Keep up the good work! Road Scholar offers many tours starting in Utah. The one I took focused of photography of the National Parks in Utah, with a professional photographer traveling with us. The schedule was set up such that we would get "the golden light" at each of the parks. Those not familiar with the term must know that the best light occurs at either sunrise or sunset, when the impact of the sun on objects is diffused by having to travel through the earth's atmosphere on a diagonal rather than vertically. As such, you can now expect that sleep will be an issue as you will get to bed late and rise early. But the territory is beautiful at all times, and more so illuminated by the golden light. In order to maximize your sleeping ability, the tour is only offered in the spring and the fall. Doing this in the winter would be pretty cold and require special equipment to traverse the snow. Doing it in the summer would basically mean no sleep as the daylight is so long. A great learning experience in beautiful territory. Thank you Road Scholar Staff for planning a wonderful introduction to Cuba today. My previous knowledge was from people who felt they had to leave Cuba more than fifty years ago. I learned from qualified professors, tour guides and from talking to Cuban people from different parts of Cuba who work in different kinds of jobs. I could see how the Cuban people have come together to meet the challenges of the past and to prepare for a brighter future. This is a fabulous program for young and old. The instructors are great with kids and adults. The activities are very well organized and varied. My grandson is already making plans for next year. Activity note: Please make sure to pack your bathing suit in your carry-on luggage, as we are visiting the Blue Lagoon on our way to the first hotel. Check-in available from 2:00 PM. Walking 1 hour on gravel paths. Breakfast: At the Northern Light Inn. On this program, breakfasts will offer a typical European style breakfast buffet with breads, cheeses, cold-cuts, yogurt, fruit, cereals, juice, milk, coffee, tea and water. Please note that water is included in the program cost at all meals. Morning: After breakfast, drive to the famous Blue Lagoon for a soak in the mineral-rich, geothermally heated waters. Following the relaxing bath we drive to Hotel Eldhestar near Hveragerdi. Afternoon: This afternoon we will have an introductory meeting. Your Group Leader will greet everyone and lead introductions. We will review the program theme, the up-to-date Daily Schedule and any changes, discuss safety guidelines, emergency procedures, roles and responsibilities, and answer any questions you may have. Indicated times are approximate. Program activities, schedules, and personnel may need to change due to local circumstances. In the event of changes, we will alert you as quickly as possible. Thank you for your understanding. Then we head to Thingvellir National Park where we have a lecture on "Thingvellir: Geological Study." Thingvellir was the site of parliament during the Saga Age (930-1262). We will take a 1 hour expert-led walk around the site with commentaries. Activity note: Walking up to 5 hours on uneven terrain and dirt paths. Ascend approx. 984 feet. Morning: An excursion to Hellisheidi geothermal power plant to learn about how geothermal energy is used in Iceland. We will then take a 1 hour hiking field trip in the Mount Hengill, one of the most powerful geothermal areas in the world. Lunch: At a local restaurant. Afternoon: We explore the Mount Hengill area further this afternoon with a 3-4 hour walk. We get the chance to take a dip in the geothermal river. Morning: We drive to Gullfoss (the Golden Waterfall) and Geysir geothermal area, where we are likely to see the hot spring Strokkur spout to the height of 25-30 meters. Afternoon: Our route to Kirkjubæjarklaustur takes us along the south shore between sea and glaciers. Stops include magnificent waterfalls and the Skogar Folk Museum, a lovely representation of the cultural heritage of the region. Activity note: Walking up to 6 hours on uneven terrain including gravel and dirt. Ascend approx. 700-984 feet. Short walks during the day (1-2 hours each) and then drive to the next hiking place. Morning: Full day walking field trip in the area of Kirkjubæjarklaustur. We will see Fjardargljufur canyon, Systrastapi mountain and Systrafoss waterfall, Kirkjubæjarklaustur’s chapel and the Church Floor (Kirkjugolf), an approximately 80 square meter expanse of columnar basalt, eroded and shaped by glaciers and waves. Afternoon: We continue our morning field trip. Activity note: Walking 2.5 hours on uneven terrain including gravel and dirt. Morning: We head for Jökulsárlón glacier lagoon for a 1 hour walking field trip followed by a short boat ride on the lagoon. Enjoy commentary from a local expert as you sail among the icebergs. Afternoon: Drive to the National Park where we will be welcomed at the Visitor Center. We will then take an approximately 1.5 hour walk in Skaftafell National Park, a natural wonderland of powerful glaciers, turbulent waterfalls, lush birch woodlands, and vibrant wildflowers with fantastic views of the mountain and its sliding glaciers. Activity note: Walking up to 6 hours on uneven terrain including dirt and rocky paths. Ascend approx. 700-984 feet. Morning: A full day walking field trip (approximately 6 hours) in Skaftafell National Park. Lunch: Packed lunch en route. Afternoon: Continue our field trip in Skaftafell National Park. Activity note: Walking up to 2 hours on uneven dirt paths. Ascend approx. 700-984 feet. In June the route to Landmannalaugar may be closed to traffic. 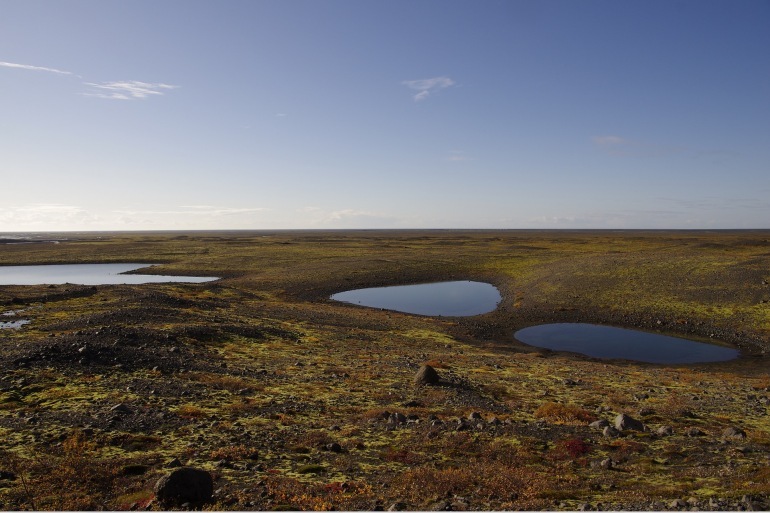 In this case, we will visit Thorsmork Nature Reserve for a walking excursion. Morning: Travel to Landmannalaugar, an oasis in the harsh interior of Iceland, for a walking excursion and a swim in the naturally warm pool. Our stay in the area will be for 2-3 hours. We continue past volcano Hekla on our way to Reykjavik. Lunch: A picnic lunch at Landmannalaugar. Afternoon: Arrive in Reykjavik. Check-in and get settled. Dinner: Farewell dinner in the hotel dining room. Afternoon: Departure for Keflavík International Airport (KEF) to check-in for departure flights. This concludes our program. Surrounded by beautiful Icelandic nature, the Hotel Eldhestar is located at the Vellir farm in Ölfus, a 30-minute drive from Reykjavik. As the first hotel in Iceland to receive the Nordic eco-label "The Nordic Swan," this hotel is committed to eco-friendly operations on a daily basis. Hotel Geirland is located near the small village of Kirkjubaejarklaustur. A quaint country hotel, it has excellent service, delicious food and breathtaking surroundings. Hotel Skaftafell is a splendid resort located near Skaftafell National Park. The hotel is sheltered by vegetated glacial moraines in front of one of Iceland’s most impressive glaciers, the Svínafellsjökull glacier. It truncates from the biggest volcano and highest mountain in Iceland, Öræfajökull (2119 m). Behind the hotel, there are many of the highest and most impressive glacier peaks in the country. In front, a vast glacial outwash plain stretches to the sea, some 20 km away. Hotel Reykjavik Centrum is a first-class hotel in the heart of Reykjavik. It is located on one of Reykjavik's oldest streets, Adalstraeti, in a newly renovated building, the oldest part of which was built in 1764. During renovations, the remains of a Viking longhouse from the Settlement Period were found. In 2006, an attractive exhibition center opened under the hotel, where the longhouse's remains are on display together with related exhibits. Among the finds excavated were Iceland's oldest human remains, dating from approximately 870 AD.